Section 504 of the Americans with Disabilities Act guarantees that a child with a disability has equal ACCESS to an education and that it is comparable to an education provided to those who do not have a disability. Since it is a civil rights law, and the Individuals with Disabilities Education Act (IDEA) is an educational law, a child who receives services under 504 does not benefit from the same mandates as a child who receives special education services under IDEA. Modifications and accommodations under 504 usually refer to improving building accessibility, classroom accommodations and curriculum modifications. A child with a disability is one who has a physical or mental impairment that substantially limits major life activities. Major life activities include: Caring for one’s self, performing manual tasks, walking, seeing, hearing, speaking, breathing, learning and working. Children with a normal ability to learn academically, but who have a mobility impairment, use a wheelchair, have a neurological disorder, or are missing a limb. Children with a normal ability to learn academically but who have a medical condition such as epilepsy, hemophilia, diabetes, AIDS, arthritis, allergies, asthma, tuberculosis, ADHD, cancer, spinal bifida and cerebral palsy. A child who has frequent referrals for behavioral problems or is under a doctor’s care for a psychological condition such as anxiety or depression. NEW! DOWNLOAD TO YOUR COMPUTER TODAY! OR purchase the bound hard copy at Amazon.com. A child may be referred by anyone for a 504 evaluation including a parent, teacher, school employee, or community agency. 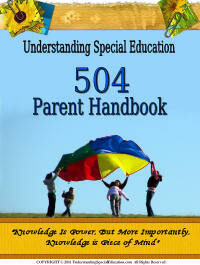 If the child fails to qualify for special education under IDEA, they may be referred for a 504 evaluation. The evaluation should include classroom observations, performance based testing, academic assessment, teacher and parent reports, and medical and/or psychological evaluations. If the team determines that the child qualifies for accommodations or modifications, the team is responsible for writing a formal plan. A child can qualify for services under Section 504 only IF the disability is shown to substantially limit his or hers educational performance. Specifics on how the modifications or accommodations will be provided and by whom. Name of the person who will be responsible for ensuring that all components of the plan are implemented (case manager). Be distributed to all of the child’s teachers, specialists, and support staff. Be placed in the child’s cumulative file. Plans should be revised and updated every year, but each district may decide when the plan will be reviewed. The child will be placed in the regular education environment unless it is demonstrated that the student’s needs cannot be met in the regular education environment. If this is the case, the child may receive special education services or services from support staff. The referral, assessment, evaluation and placement process should be completed within a reasonable time and should not exceed 60 days. Susan is in a wheelchair. She will be given extra time to get to her classes without being considered tardy or receiving consequences for being late. She will be assigned a specific seating area in the class to accommodate her chair. Austin has diabetes. Twice a day, he will go to the nurses office in order to check his glucose levels. He will be allowed snacks at times other than lunch if necessary. Kyle has ADHD. He will be given preferential seating in the front of the class, given extra time on writing and homework assignments and his progress will be monitored by a weekly progress report. Indicate who will be responsible for implementing the modification or accommodation. Indicate the contact person at the school who will be the case manager for the plan. This is often a counselor, administrator or school psychologist. If the plan is not meeting your child’s needs, refer them back to the team or to your school’s student study team (SST) for additional modifications or ask for a referral for a special education evaluation. If your child does not quality for any accommodations or modifications, you can work on improving their school success by strengthening their study skills. I also encourage you to utilize the parent-teacher conference as a valuable tool, not only improve communication between you and the school, but also to get regular feedback on your child's progress.